Man Who Jumped Fence, Entered White House Had A Knife : The Two-Way The Secret Service is looking into how a Texas man was able to breach the White House's security Friday. The man scaled a fence and opened a door to the residence before being arrested. A Secret Service police officer stands near an entrance to the White House complex during an evacuation, minutes after President Barack Obama departed Washington for Camp David aboard Marine One. A man scaled a fence and reached the residence last night. The man who managed to climb the White House fence and open the door to the executive mansion Friday night was armed with a knife, the U.S. Attorney's office said. The Secret Service had originally reported that the man was unarmed. The Secret Service has stepped up security at the White House after an intruder managed to enter a door on the residence, the agency said in a statement Saturday, one day after the breach in security. 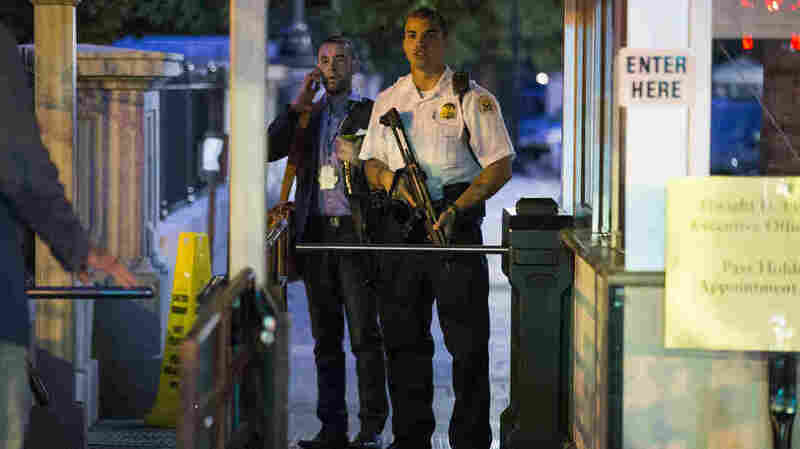 Secret Service director Julia Pierson has ordered enhanced officer patrols and surveillance around the White House complex; the increased security measures went into effect Friday night. Pierson has also ordered a comprehensive review of the event, with the findings to be submitted to Secretary of Homeland Security Jeh Johnson, the statement said. The Secret Service is looking into how a Texas man was able to get inside one of the world's most secure buildings, after the agency apprehended an intruder who had scaled a fence and opened a door to the White House last night. The man was not armed. The agency says Omar J. Gonzales, 42, ignored warnings from security personnel and was apprehended at 7:20 p.m. Friday — but not before he entered the White House's North Portico doors. The incident, which took place shortly after sunset in Washington, sparked an evacuation and led agents to scramble around the property, some of them with guns drawn. President Obama and his family were not at home when the security breach occurred. "He and his daughters had departed from the South Lawn on Marine One just minutes before to head to Camp David in Maryland for the weekend," ABC News reports. The White House says that Michelle Obama traveled separately to Camp David. Video of the scene shows the man running toward the residence as officers posted at the perimeter tell people to get back from the fence. Citing a Secret Service official, The Washington Post reports, "the official said that at least part of the reason that the man managed to get so far was that he did not appear to be armed or carrying anything. In addition, the official said, first family members were not inside." After he was taken into custody, Gonzales was taken to a hospital for evaluation. "Rep. Jason Chaffetz, R-Utah, who chairs the House subpanel on national security oversight, called it 'totally unacceptable' but said the incident was just one of a string of security failings on the Secret Service's watch. "'Was the door open?' he added incredulously." Secret Service spokesman Ed Donovan said the security breach is "not acceptable to us and it's going to be closely reviewed." He said the review will include a check to be sure all agents followed their security protocols. "It was unclear whether any other fence-jumpers have ever made it into the White House, one of the most highly protected buildings in the world. But Friday's incident was just the latest setback for an elite agency whose reputation has suffered a succession of blows in recent years."